Revisiting classic texts in economics normally needs no justification beyond the benefits that come from looking at old ideas through new eyes. As we learn and grow as readers, we see new things, are more skeptical of old things, and make connections that we never did before. Some of my favorite books in my collection are those with layers of marginal notes from the multiple passes I’ve made through the book. Socialism by Ludwig von Mises is an excellent example of a book for which multiple reads have been greatly beneficial. However, there’s one more reason why it’s an opportune time to take another look at Socialism. As it approaches its hundredth anniversary in 2022, it has fresh relevance in a world where socialism is making something of a comeback among young progressives. The sheer length and breadth of Socialism makes it challenging to cover in a format like this, so one must pick and choose. In what follows, I will emphasize three areas the book covers. I will spend the most time on the economics of socialism and what the book has to say about the contemporary debate over the viability of various forms of socialism. But I also want to talk about two of the lesser known pieces of the book. One of those is the chapter on love and the family, where Mises was quite a bit ahead of his time in his analysis of the ways in which capitalism and liberalism had transformed marriage and the family. The other is the section on “social evolution,” in which he offers an alternative to the Marxian reading of history. Socialism was published in 1922 on the heels of Mises’s famous article “Economic Calculation in the Socialist Commonwealth,” which appeared two years earlier. Mises offered an economic case for why a socialist economic order could not determine how to use resources rationally and would be unable to generate the wealth that markets did, much less the abundance that socialists promised. That article launched what came to be known as the “Socialist Calculation Debate” which lasted until roughly World War II. The argument of that paper forms the core of Socialism, but the book covers much more ground, as its subtitle of “An Economic and Sociological Analysis” suggests. Mises thought that socialism needed a comprehensive refutation, covering not just the failures of economic planning, but socialism’s analysis of history, its theory of monopoly, the relevance of classes, and its ethics. The book covers all that ground and more. Those arguments are also applied to a variety of forms of socialism, making it comprehensive not only in the range of arguments he raises but also how widely he applies them. Despite the fact that a fair number of his references and the particular topics he’s concerned with are specific to the period in which it was written, it still remains very much a timeless work, and probably the single best book to read for a sustained critical engagement with socialist ideas. At the center of his criticism is Mises’s claim that rational economic calculation under socialism is impossible. Mises begins his argument by taking socialists at their word, assuming that socialism will substitute conscious planning for the “anarchy of production” (to use Karl Marx’s term) of the marketplace. That means that rather than relying on prices and profits to tell us what we should produce and how we should produce it, socialism would abolish private property, exchange, markets, prices, and profits and substitute collective ownership and decision-making to answer those questions. Under capitalism, we allow private owners of the means of production to experiment with alternatives and discover only after the fact which ones were best. Marx and other socialists believed not only that this was wasteful, but that it could be improved on by collectively deciding before the fact what should be produced and how, then just executing that plan, including who should receive which goods in the end. Socialism, they claimed, would be more rational and more efficient, as well as more just. In his 1920 article, and at greater length in the book, Mises asks whether it is possible to know what people want and how best to produce it in the absence of markets and private property in the means of production. While there might be a number of technologically feasible ways of producing a particular good, only one of those ways uses the least valuable resources possible and is therefore the most economically efficient. The challenge of rational economic calculation is having a process for figuring out which of the technologically feasible options is the least wasteful one. For a society to answer that question, it must have some means of comparison. Mises offers a variety of reasons why using a measure of labor time, as the Marxists suggested, will not work, including the differences in quality of labor. What needs to be determined is how much alternative inputs are valued, and after the marginalist revolution of the 1870s, economic theory treated economic value as based on the subjective valuations of individual choosers. So how best to access and aggregate those valuations in a form that allowed for comparisons among alternatives? Mises argues that only market prices can perform that function adequately, if imperfectly. In any social order, even under Socialism, it can very easily be decided which kind and what number of consumption goods should be produced. No one has ever denied that. But once this decision has been made, there still remains the problem of ascertaining how the existing means of production can be used most effectively to produce these goods in question. In order to solve this problem it is necessary that there should be economic calculation. And economic calculation can only take place by means of money prices established in the market for production goods in a society resting on private property in the means of production. That is to say, there must exist money prices of land, raw materials, semimanufactures; that is to say, there must be money wages and interest rates. Too often in contemporary discussions of socialism, those making the case against the market argue on ethical grounds, never considering the set of questions Mises poses here. Asserting that government-provided health care should be a right does not answer the questions of what government should produce and how it will know how to produce it in something close to a rational way. All decisions about production require the ability to engage in economic calculation, and that requires prices, profits, and private property. Without market prices, producers are just groping in the dark. This lesson applies with varied degrees of force to all proposals to substitute government ownership and planning for the market. Socialism also contains two chapters that discuss “Particular Forms of Socialism” and “Pseudo-Socialist Systems.” In those chapters, Mises deploys the calculation argument, along with other ideas from economics and elsewhere, to show why these systems will face the same sorts of problems, though perhaps less intensely, as would full-fledged socialism. He does not really discuss what today goes under the name “democratic socialism,” because he was writing before socialism had fully revealed its inherent, if unintended, tendency toward totalitarianism. It is the decades of failures of economic planning that left institutions of power to be taken over by those with a comparative advantage in exercising it that necessitated putting the adjective “democratic” before socialism. Even a socialism that rejects totalitarianism and intends to allow democratic processes to make the decisions previously made through the market must confront the calculation problem. Moving from a central planning board or a dictator with a five-year plan to bottom-up democratic processes does not solve the problem of rational economic calculation in the absence of private ownership of the means of production and the market prices it produces. The problem with democratic socialism, Mises might have said today in response, is that, democratic or not, it’s still socialism. The sociological parts of Mises’s analysis of socialism can be read in the context of the fact that he followed this book with another, Liberalism, in 1927. The contrast between the liberalism of the 19th century and the socialism emerging in the 20th century was, I believe, central to Mises’s worldview. We see that in Socialism from the very start, as the first section of the book is titled “Liberalism and Socialism.” Here Mises broadly describes the long evolutionary process that produced the liberal order as a movement from violence to contract as the basis of social interaction. Mises argues that, in the economic realm, the rule of law and the development of property rights and contract overcame the use of violence as the predominant way of determining and changing ownership. The emergence of market institutions was a move away from violence toward contract. Similarly in the political realm, the development of democratic processes and institutions offered a peaceful form of political change to contrast with the violence associated with monarchy and other pre-democratic forms. For Mises, the great advantage of democracy is the peaceful passing of power when obeying the contract-like rules of a liberal constitutional order. One of liberalism’s greatest accomplishments was the gradual extension of equal rights to all humans, and in treating women as equals under the law, liberalism advanced the feminist cause. Feminism understood as equality before the law is, he argues, “nothing more than a branch of the great liberal movement, which advocates peaceful and free evolution” (page 87). As women became the legal equals of men, and as marriage became contractual like so much else, love and sexual desire took their modern place in marriage.2 What is most striking about this argument is how far ahead of its time it was. Sociologists into the early 21st century were still making the argument that it was the liberal and market orders that enabled love to conquer marriage as if it were news.3 Mises saw this point almost a century earlier. This discussion has two purposes in Mises’s larger argument. First, it shows that capitalism and liberalism were responsible for many of the social advances of the modern era, rather than being the cause of any number of social problems. Second, it sets up his fear that socialism will return us to an age of violence and undo all of that progress. It leads men to regard each other as comrades in a joint struggle for welfare, rather than competitors in a struggle for existence. It makes friends out of enemies, peace out of war, society out of individuals. For more on these topics, see the EconTalk episode Pete Boettke on Mises. See also the Library of Economics and Liberty articles “What Makes Capitalism Tick,” by Arnold Kling, April 2, 2018; and “An Unavoidable Theory of the State,” by Pierre Lemiuex, June 4, 2018. For background information, see Socialism, by Robert Heilbroner in the Concise Encyclopedia of Economics. As the core institutions of the liberal order are being increasingly attacked by the populist-nationalist right and the socialist left, it is worth revisiting a text that causes us to grapple with the fundamental questions raised by the emergence of liberalism and its tragic eclipse in so many places by 20th century socialism. 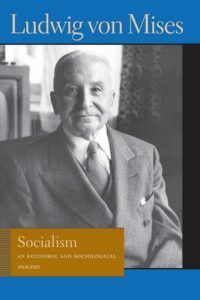 Mises’s Socialism, written well before most of the bloodshed and poverty caused by socialism unfolded, remains a timely and deep exploration of both the errors of socialism and the virtues of liberalism. Despite socialism’s record of failure, or perhaps because of it, the socialists of the 21st century have yet to grapple with the fundamental issue of economic calculation outside of the market and how the absence of private ownership of the means of production, no matter how democratic the alternative is, will inevitably lead to poverty and chaos. The arguments raised in Socialism remain as central as ever to the defense of the liberal order against its critics, both old and new, and left and right. Page numbers are from Socialism: An Economic and Sociciological Analysis, by Ludwig von Mises. Translated by J. Kahane, Foreword by F. A. Hayek. Liberty Fund. Online at https://www.econlib.org/library/Mises/msS.html. For more on this process, see my Hayek’s Modern Family: Classical Liberalism and the Evolution of Social Institutions, New York: Palgrave Macmillan, 2015. See, for example, the excellent book by Stephanie Coontz, Marriage, A History: How Love Conquered Marriage, New York: Penguin, 2006. Both are chapter titles from Hayek’s The Constitution of Liberty, which Hayek saw as a restatement of the great principles of liberalism. *Steven Horwitz is the Distinguished Professor of Free Enterprise in the Department of Economics at Ball State University in Muncie, IN. He is also an Affiliated Senior Scholar at the Mercatus Center in Arlington, VA, and a Senior Fellow at the Fraser Institute of Canada. He is the author of three books, including most recently Hayek’s Modern Family: Classical Liberalism and the Evolution of Social Institutions. He has written extensively on Hayek and Austrian economics, monetary theory and history, and American economic history, and is a frequent guest on radio and cable TV programs. For more articles by Steven Horwitz, see the Archive.